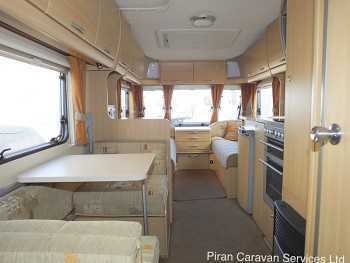 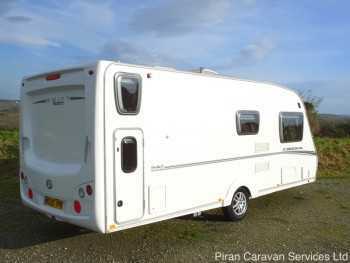 This stunning Abbey Cardinal 540, with it's clever 6 berth layout, has been fastidiously cared for. 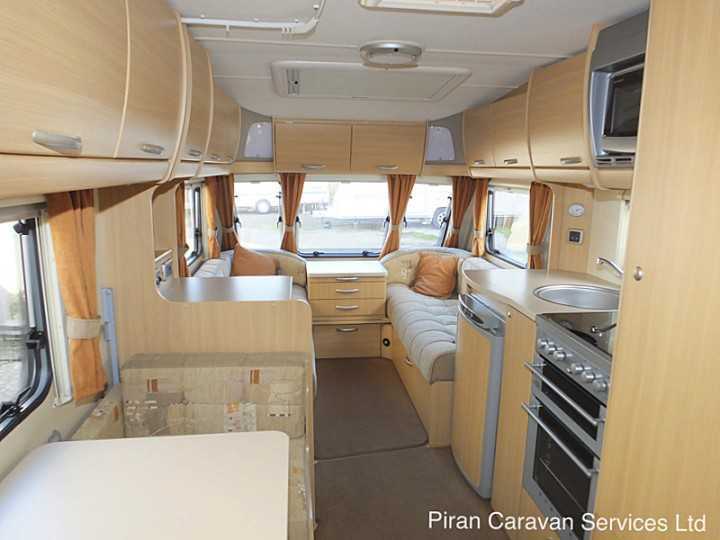 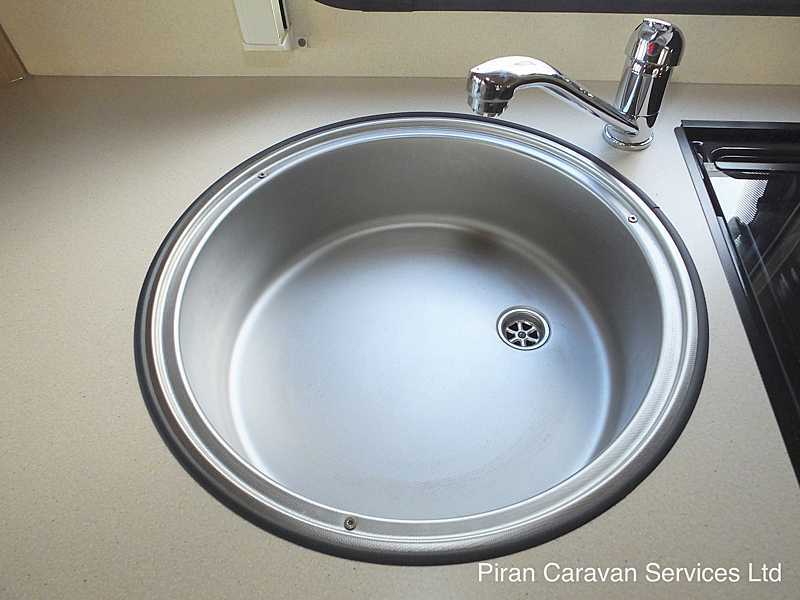 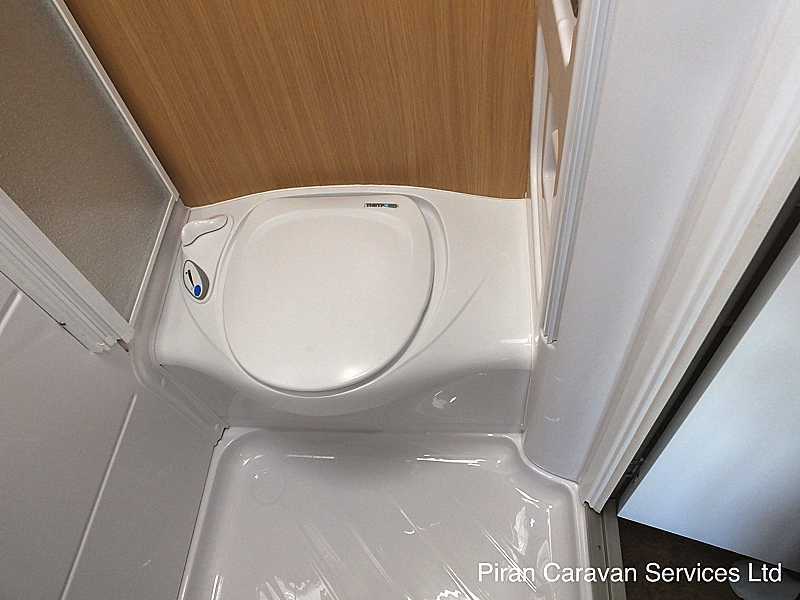 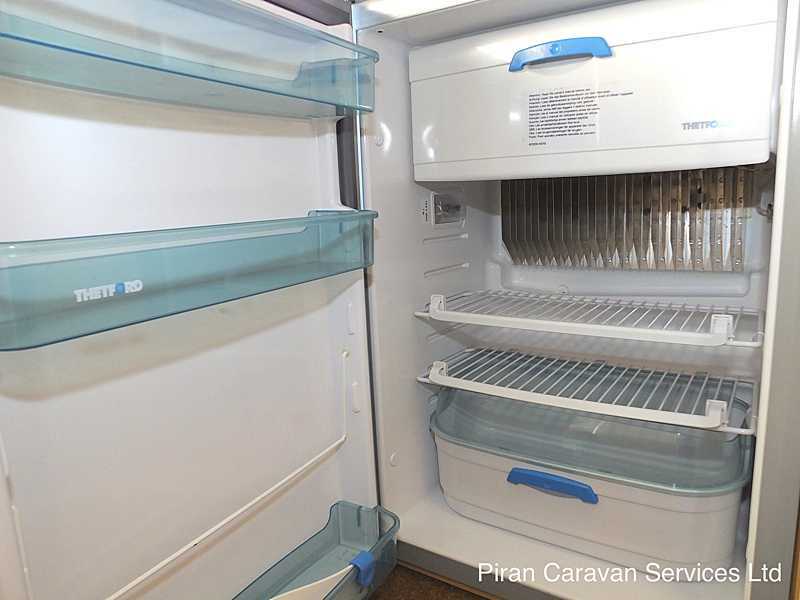 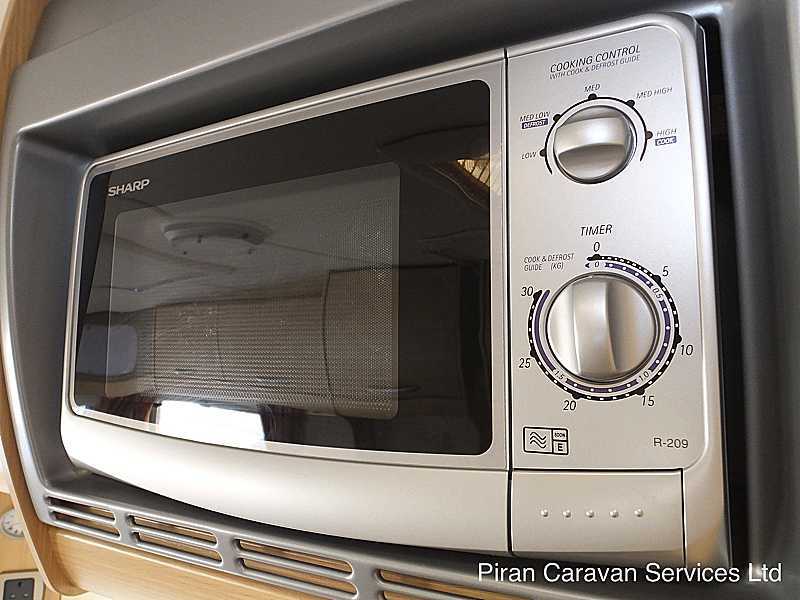 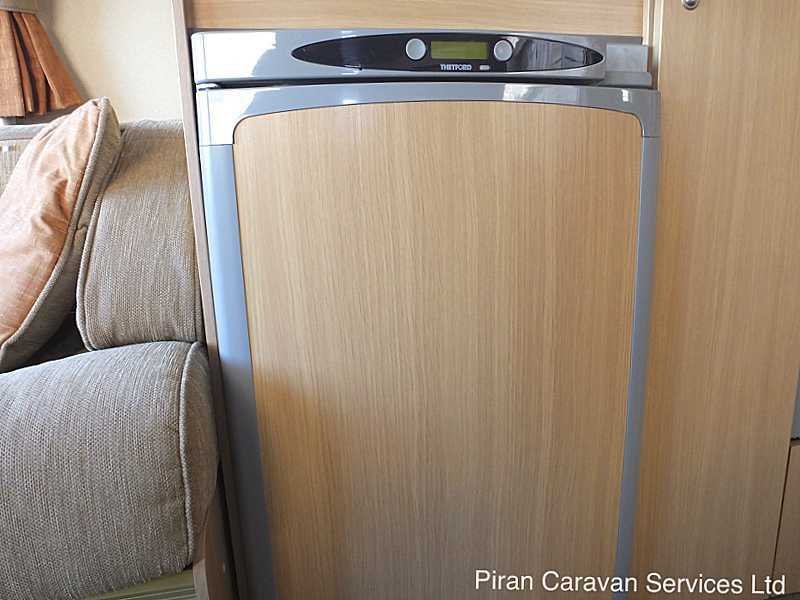 The caravan has been serviced on an annual basis and comes with a comprehensive set of service records and all the orginal manuals and instructions. 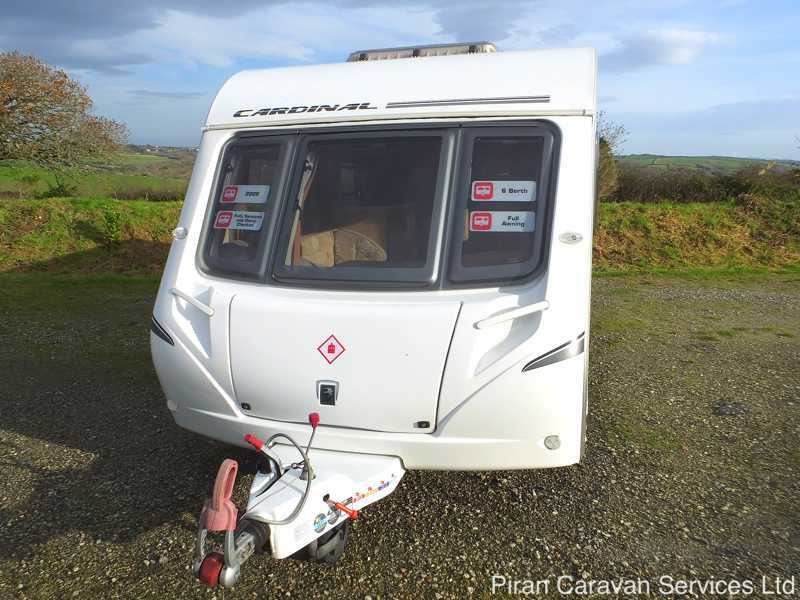 This caravan is a credit to its former keeper and has been kept in fantastic condition both inside and out (non smoking owners) There is a Powrtouch remote motor mover which is just 2 years old, making siting the caravan on a tricky pitch or narrow driveway a piece of cake. 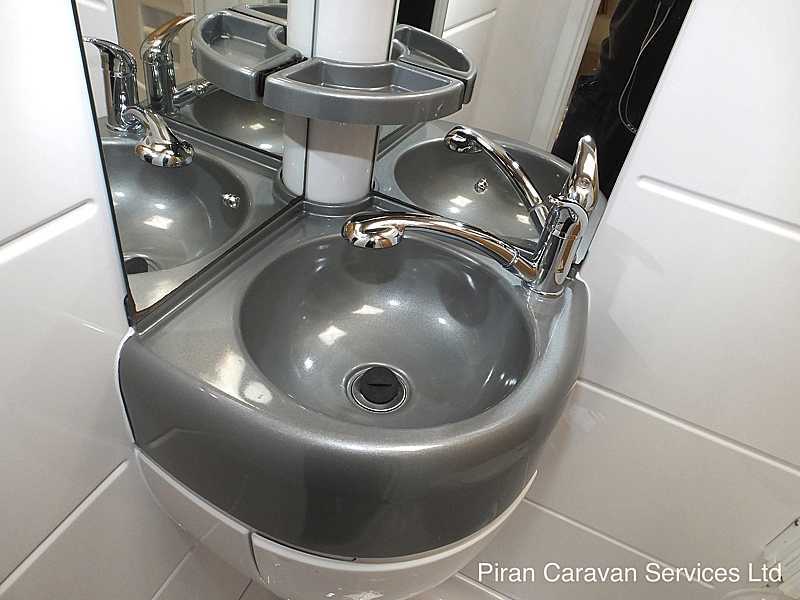 The well-designed layout provides comfortable sleeping and living space for 6 people and is perfect for families looking for a luxurious touring caravan. 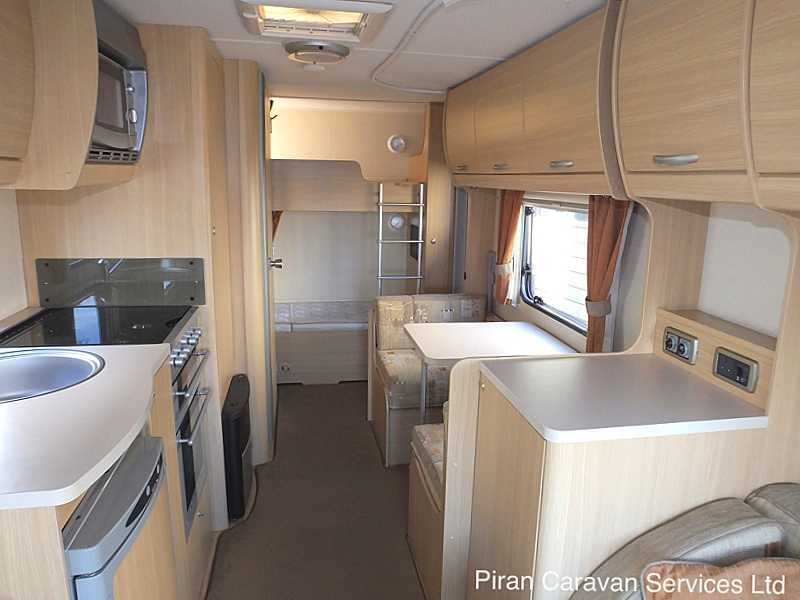 Based on the award winning Abbey Vogue, the Abbey Cardinal 540 was a special edition 6 berth caravan, made by Abbey for Davan Caravans Ltd, featuring a with a spacious lounge, side dinette and rear bunks layout. 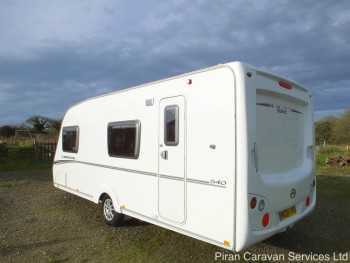 To the standard Abbey Vogue was added a number of extras, resulting in one of the highest specification 2009 caravans in its class. Although manufacturered in 2009, this caravan was first registered in July 2010 and badged as a Swift, after Swift aquired the Abbey company. 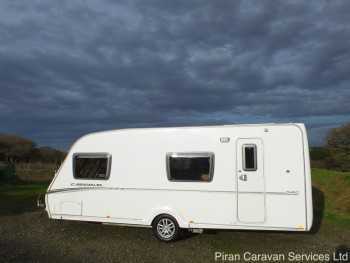 The Abbey Cardinal is built on an Al-Ko galvanised chassis with an Al-Ko Euro overrun device and two way assisted handbrake. 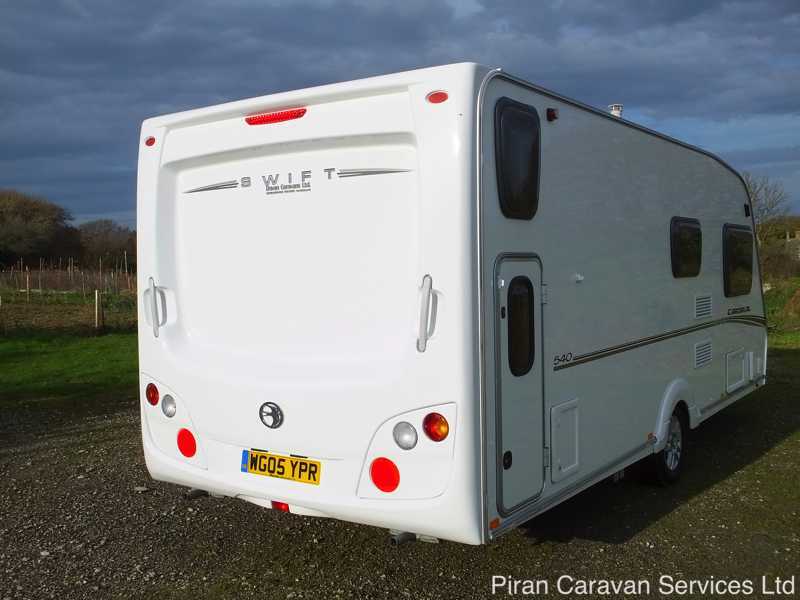 The chassis features an Al-Ko 3004 stabiliser hitch, 14" alloy wheels and a spare wheel in an underslung carrier. 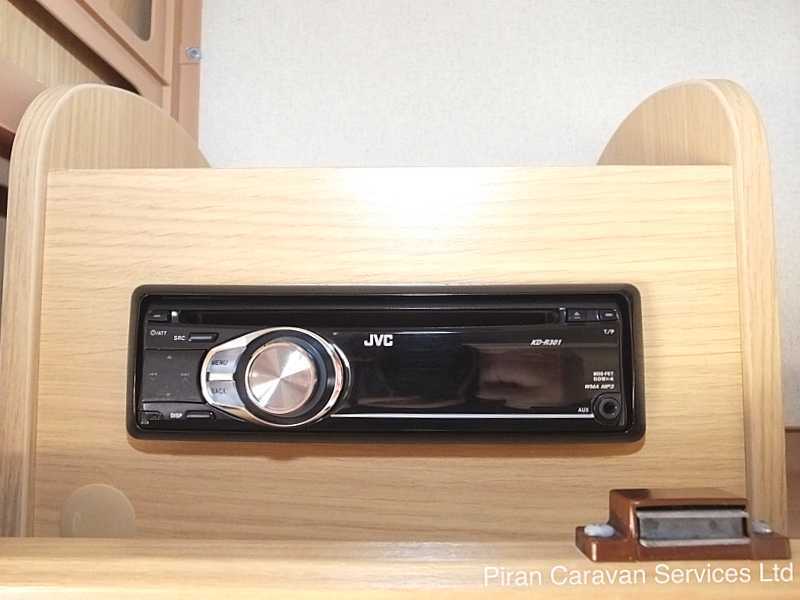 The caravan is factory-fitted with a passive infra-red alarm system, lockable heavy-duty corner steadies, Al-Ko Secure wheel lock receivers and a hitch lock. At the front of the caravan, 3 large double glazed windows provide a panormic view from the spacious lounge which features 2 long bench seats, with aluminium frames for strength, which can be used as single beds, or made into a large double using the slats stored underneath the chest of drawers. 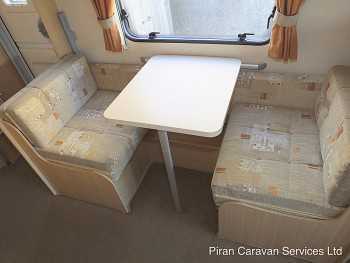 There is a pull-out coffee table located above the chest of drawers and a folding table, which is housed in a separate locker, provides dining space for 6 people. 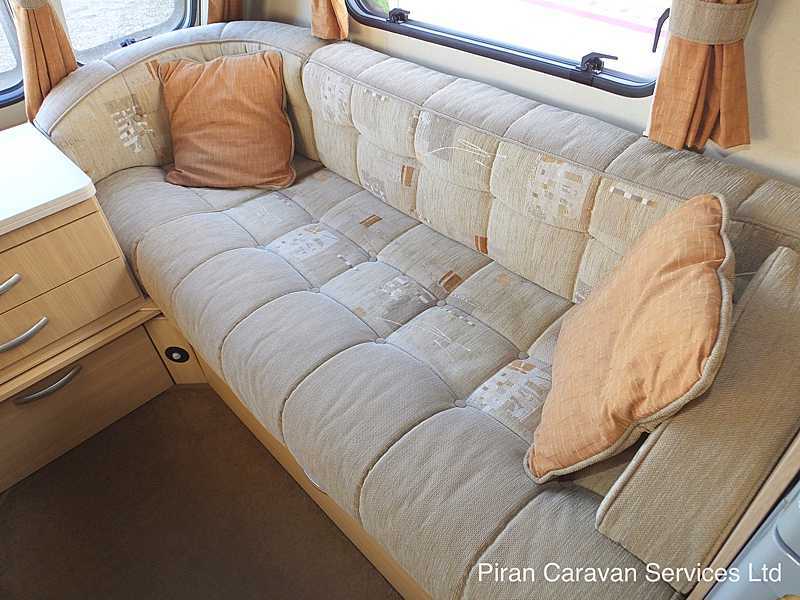 The seats feature sprung interior cushions and luxury upholstery in muted colours, which is complemented by matching curtains, scatter cushions and unmarked drop-in carpets. 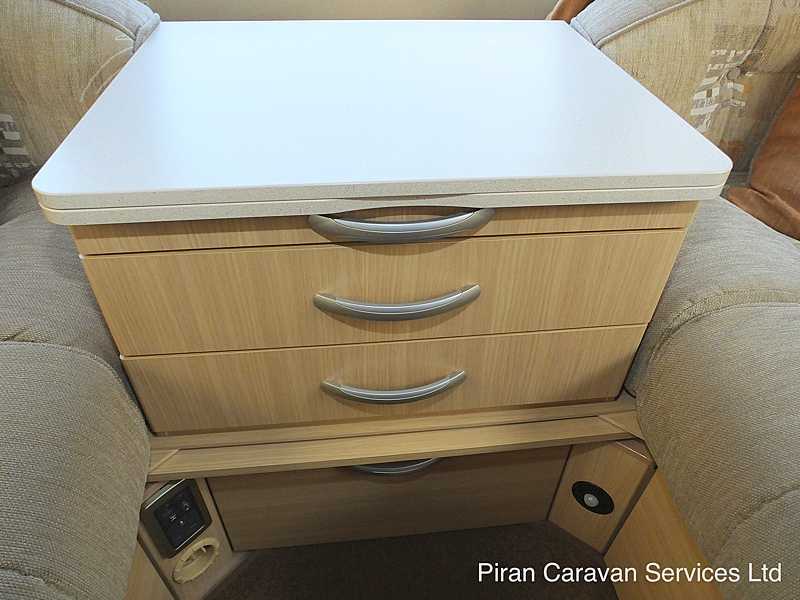 The overhead 'aircraft-style' lockers provide a large amount of storage and these, like the rest of the furniture in the van, are finished in Ferrara light oak wood grain. 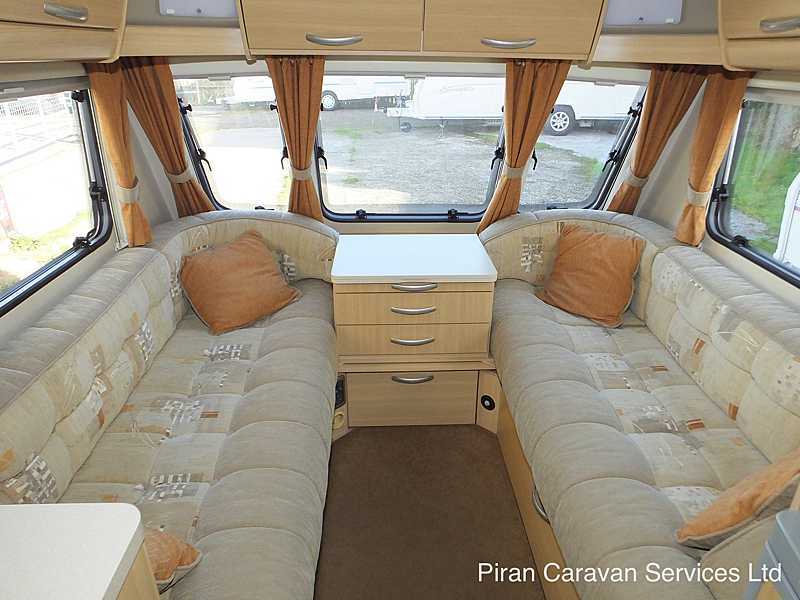 Above the lounge is a Heki 2 roof light providing light and ventilation to the living area. 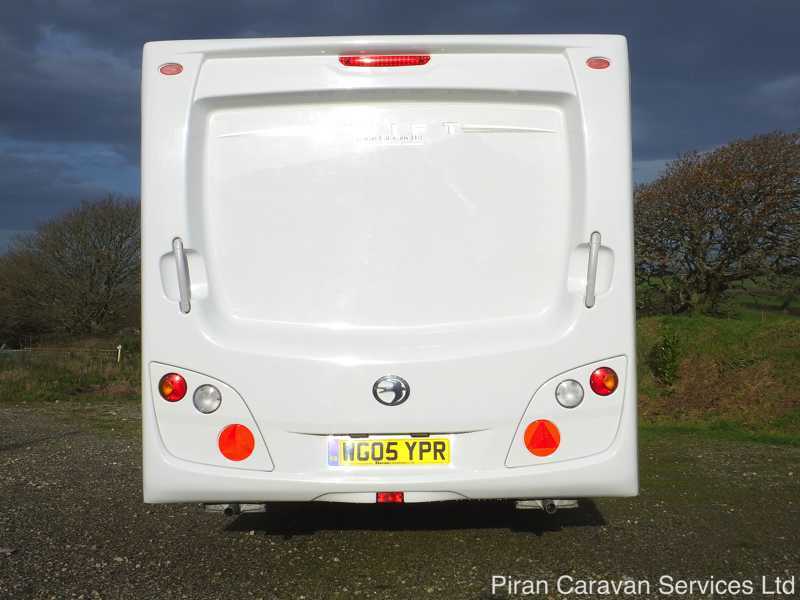 All of the windows in the Cardinal are double-glazed and feature black out blinds and fly screens and the curtains run on twin tracks for ease of use. The windows are also fitted with night latches to provide ventilation overnight. 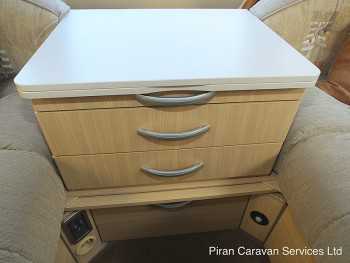 Moving back through the Cardinal there is a TV point with both 230v and 12v sockets and the caravan is fitted with a Status 530 directional area and booster. 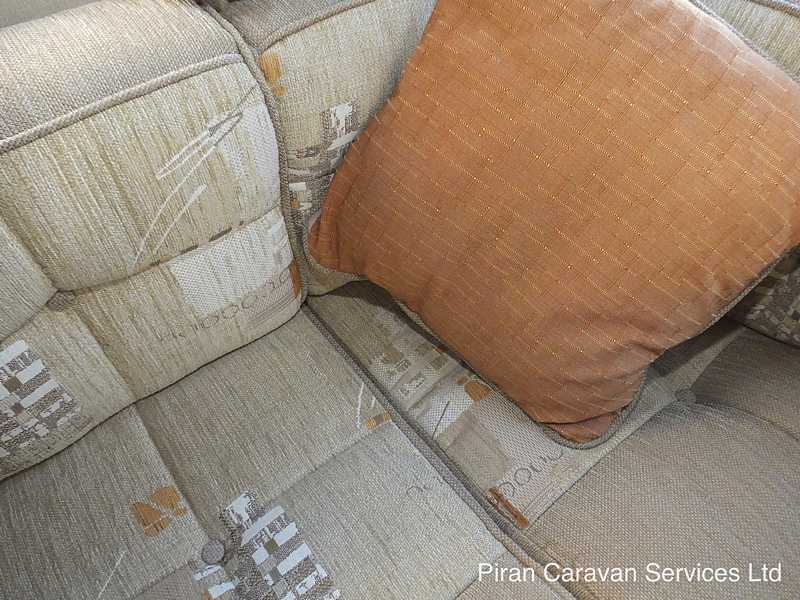 Next to this is the side dinette, upholstered in the same fabric as the lounge, with two single seats and a table for additional living or dining space. The side dinette converts into 2 single bunk-type beds and this area can be separated off from the rest of the caravan with a privacy curtain. 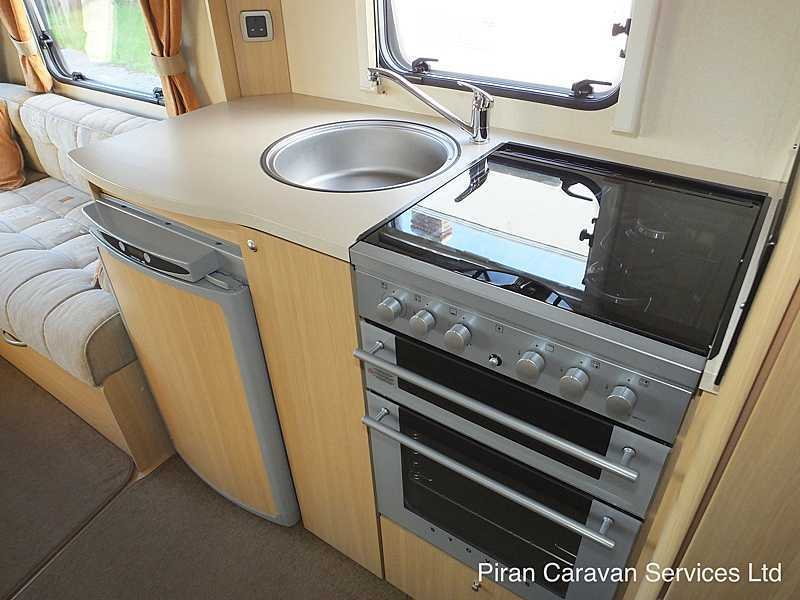 Opposite the side dinette is a spacious and well-appointed kitchen with a large 107 litre 3-way fridge with digital controls and electronic ignition. 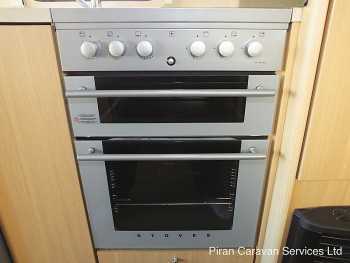 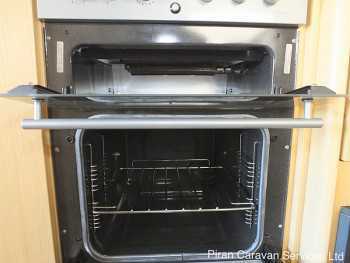 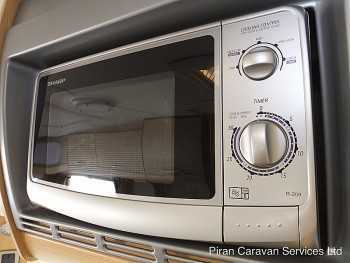 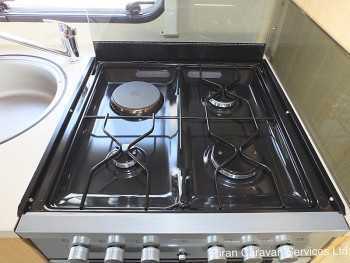 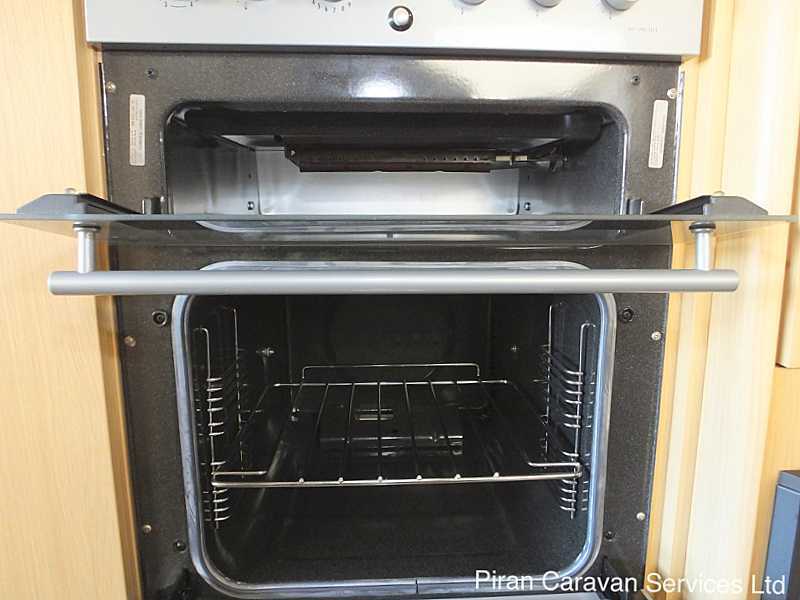 The kitchen area is also equipped with a Stoves oven, grill and dual fuel hob, with a built-in microwave oven. There is also a recessed stainless steel sink with removable drainer and chopping board. 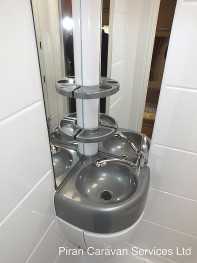 There is an Omnistor 3 speed extractor fan in the kitchen ceiling providing ventilation. 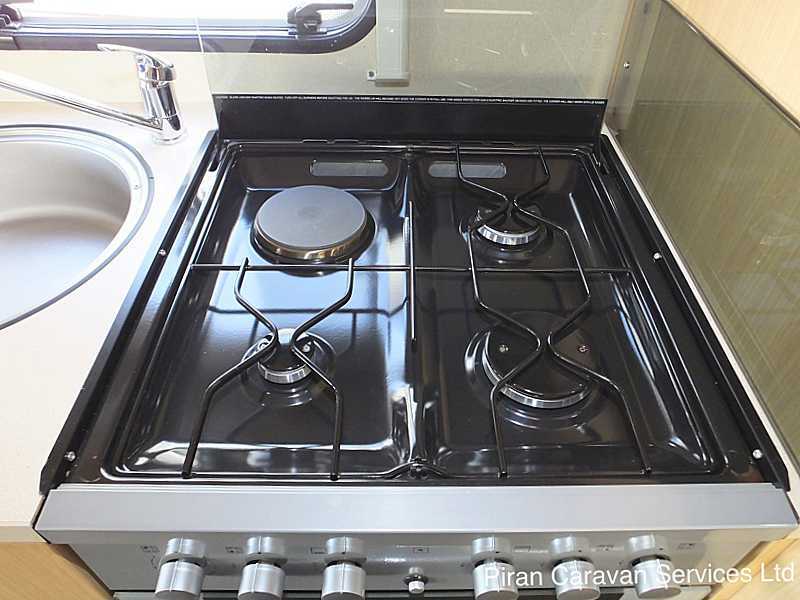 There is plenty of additional storage space for crockery and utensils and the useful worktop is finished with solid ash edges. Next to the kitchen is a well-equipped washroom with a separate fully-sealed shower cubicle and Thetford c-250 cassette toilet with electric flush. Hot water is provided by the Truma dual fuel water heater, by way of an in-board water pump with pressure regulating accumulator. 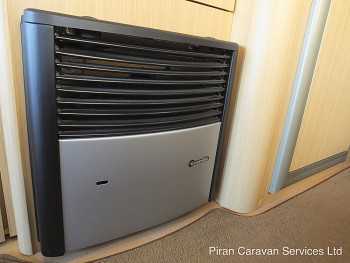 Heating in the caravan is taken care of by the tried and tested Trumadual-fuel blown air heating system. 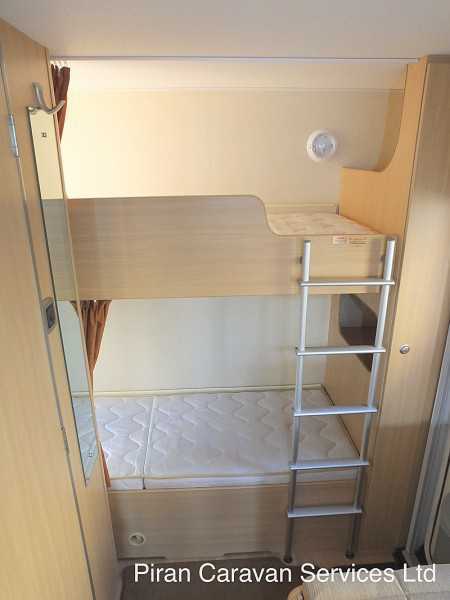 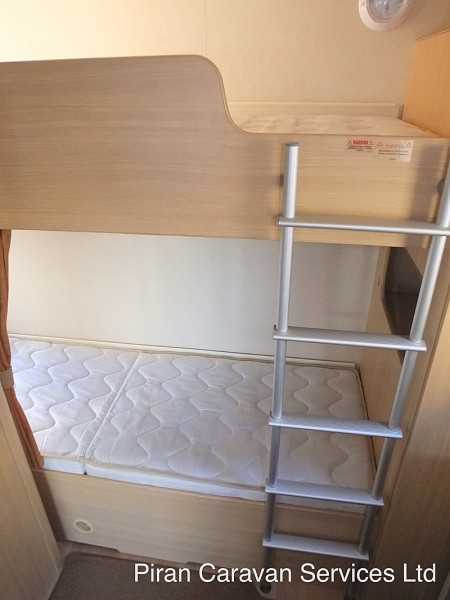 In the rear of the caravan are 2 transverse bunk beds with access ladder and invidiual bunk storage, made to measure mattresses, covers and bedding, providing perfect sleeping arrangements for children. There are double-glazed windows and blinds at each bunk level. 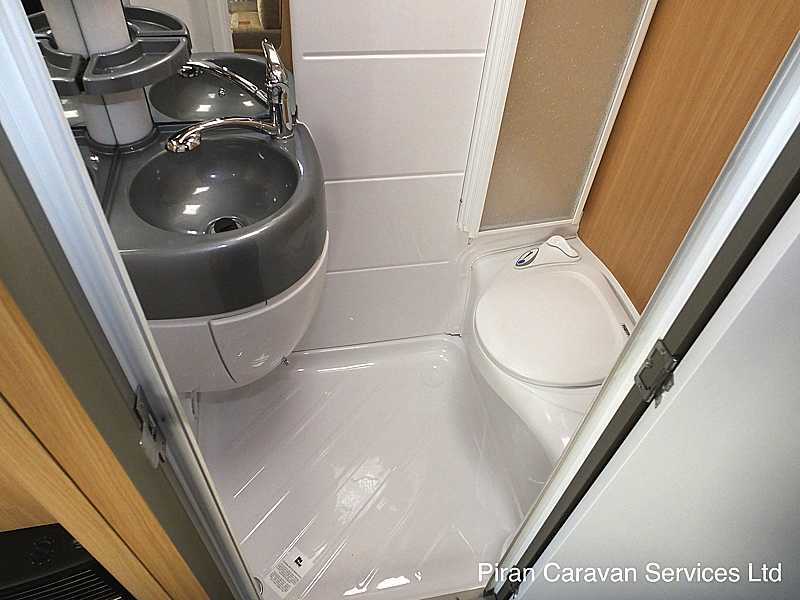 In summary, this is a fantastic example of a very spacious 6 berth caravan, with a layout which is simply ideal for people with children. It is Cris registered and comes with service history and all the original manuals. 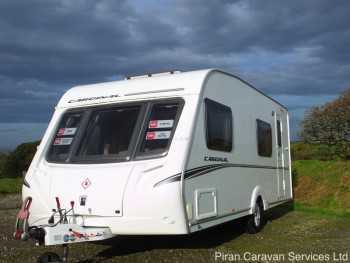 It is also being sold with a nearly new Kampa Ace air 400 inflatable awning and full Dorema awning both of which are in as new condition, a Calor Lite 5kg propane gas bottle, Al-Ko hitch lock, draw bar cover, hook up cable and leisure battery, making this caravan fantastic value for money. 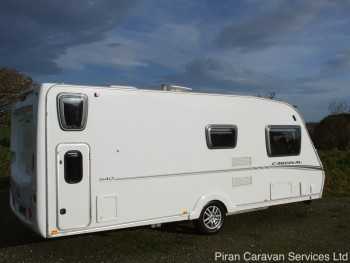 The fact that it has recently been fitted with a powrtouch Evo remote motor mover makes it exceptional value for money. Abbey cardinal has been fastidiously maintained both inside and out and will be fully serviced and damp checked prior to sale, providing peace of mind for its new owner.